November 23, 2008 by Alphageek in "alphageek bourbon virginia tech"
This is a very humbling article. The Alphageek decided to post this as a sort of instructional opportunity. The Alphageek is posting this story as an inspiration to the less technologically savvy reader. 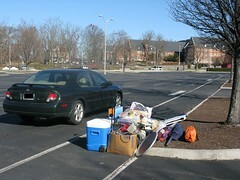 You look at the picture at the picture and go, "why is there a car and a picture of a bunch of junk?" That stuff is not junk, it is valuable items needed for an exciting tailgate. Your next question, if you are thinking, (please go along , even if you are not thinking) "why not just have a picture of everything all set up." The answer is simple: massive system failure. Simply put: the tailgate was called. Things started great. After awakening, we turned on the local weather forecast. The local tv station weather guy called for warming and less wind in the fine mountains of southwest Virginia. The weather channel geek he was not because this report proved to be almost entirely wrong. We drove to the traditional parking place to set up our tailgate party. The first step is to set up the flags. Due to the high winds, setting up the flags was easy and beautiful. We unfurled the flags and let them fly proudly, flags flapping in the strong wind. We then moved on to set up the tailgating tarp. It went up quickly and easily. We moved along to adding the sides. We attached the sides, along with the weight to hold down the tent. We also chained the contraption to a tree. These precautions were not enough to hold the tent down and we had to remove the sides. It was either take it down or have the wind destroy the tent. Moving along, we decided to start with electricity. We have a fine Honda generator that starts on the first or second pull, until this day. I estimate that I pulled that handle 50 times to get the the generator started. I decided to take a break and eat something. I had some chips that needed salsa. I decided to open the salsa we purchased the night before. The salsa had mold in it, after taking 10 minutes to unscrew the jar. We then set up the satellite dish. This was going well until I needed the receiver box to work. The box happily beeped away and indicated that it had no signal. Somehow, the box has failed (failure was later confirmed at home...). This failure occurred after an earlier indication that the box does not work in teperatures below 39 degrees Fahrenheit. We had to put the box in the car to even get the error beeps. At this point, some guests arrived at the tailgate. I suggested we have some hot soup prepared just for the event. The soup was nice and hot in the crock pot, running on the electricity from the generator. By the time the soup was ladled from the pot to a cup and eaten with a spoon, it was lukewarm at best. When someone said "hey, let's go to my place and order a pizza", what could I say? At least the beer is cold? I simply asked "who will help me pack this stuff up?" We packed up, and headed out. The pizza sure was good. It goes to show that weathermen don't know everything. Instead of warming (as predicted) it got colder and colder throughout the day.